TCU is pleased to announce that the concert hall in the new TCU Music Center will be named the Van Cliburn Concert Hall at TCU in honor of the beloved concert pianist and Fort Worth legend. This new intimate hall, with a little more than 700 seats wrapping fully around the hall, is designed acoustically as a grand concert hall, with similar acoustical volume to mirror concert halls with double to triple this seating capacity. The acoustical environment is adjustable, so it can be tuned, depending on the nature of the performance. 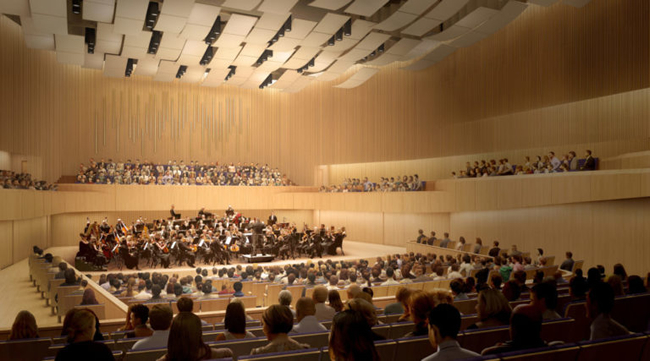 The TCU Music Center is schedule to open in fall 2020.